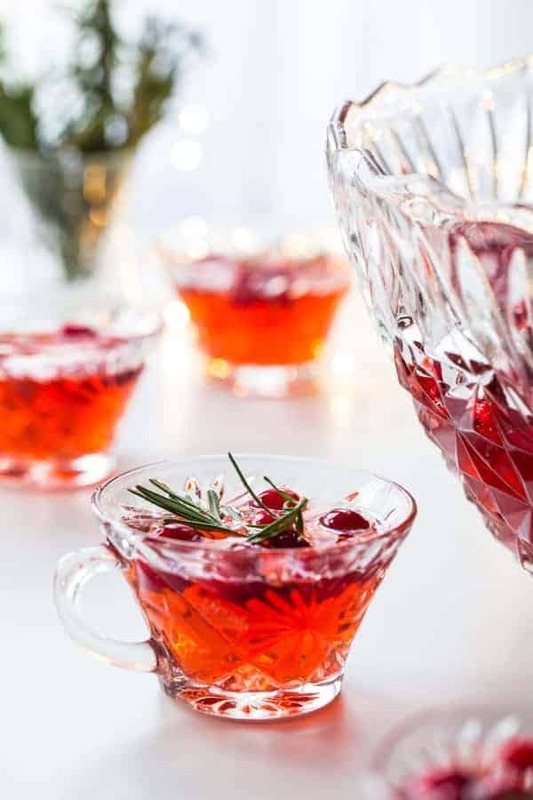 Sparkling Cranberry Rosemary Punch will elevate your holiday party to something truly elegant. Enjoy its herbacious flavor with your favorite appetizers. Are you planning a Christmas party this year? We are and I am very excited about it. Although I tend to get a little stressed out at this time of year, I do love having people over for the holidays. I’m kind of one of those go big or go home types when it comes to holiday entertaining. I’ll spend days planning and prepping everything for Christmas Eve dinner, Christmas Day brunch and dinner. You might think I’m a little nuts for volunteering to host people for three separate meals over the course of two days, but it’s my thing and I kind of love every second of it. Except for the dishes, but I typically refuse to do those. There is always plenty of food and drinks. In fact, people come prepared to our gatherings with their own to-go containers. Because they know, this girl isn’t parting with her beloved glass storage containers. 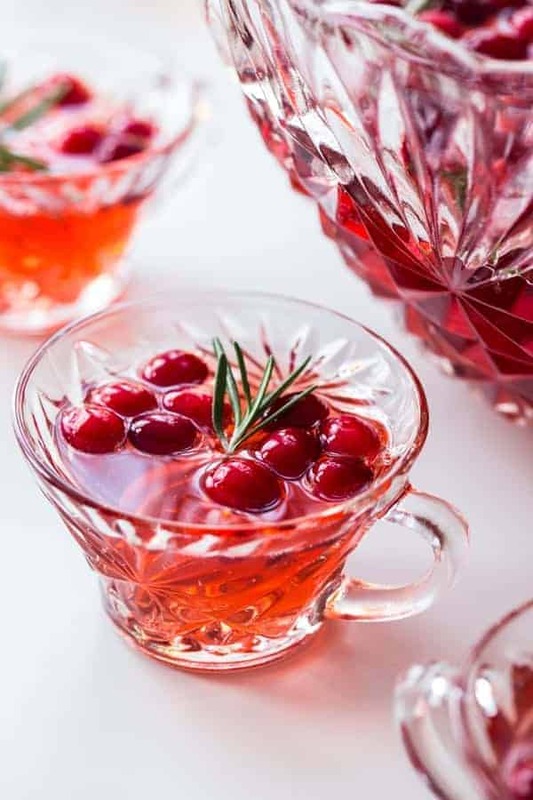 For Christmas dinner this year, we’re serving up prime rib with sides galore, but there will also be good cheese, and good charcuterie, and this Sparkling Cranberry Rosemary Punch too. It’s sweet, and tart, with just the right herby notes thanks to simmering it low and slow with rosemary. Fresh, tart cranberries and oranges round out the flavors. 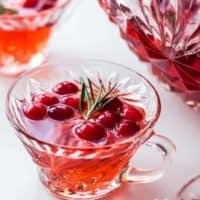 This Sparkling Cranberry Rosemary Punch is made with Everclear, which I think makes all the difference. When proofed correctly, Everclear provides an excellent base for a punch like this. Smooth, with just the right amount of.. well… punch. It also has the ability to make other flavors stand out, like the rosemary, and tonic water. If you love the tonic part of a gin and tonic, you are going to adore this drink. The bubbles from the tonic water add a perfect bite with each sip. 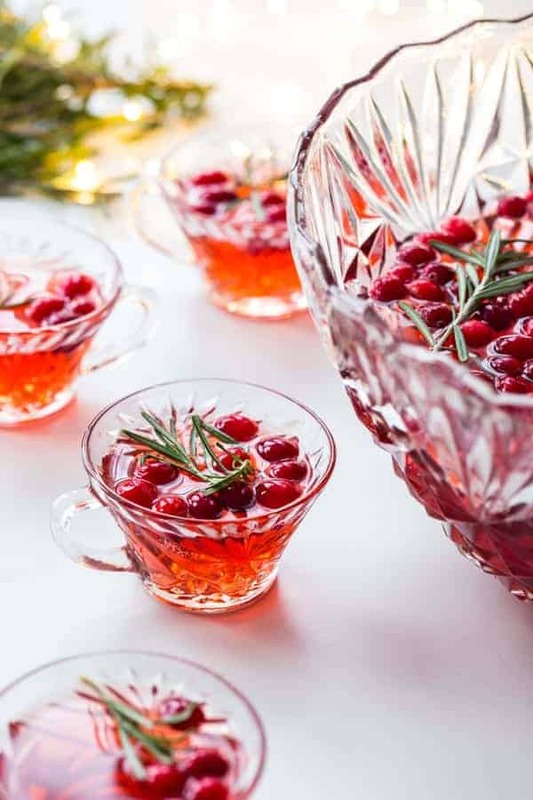 I just love cranberries and orange in just about anything, from scones and muffins to spooned over brie, and they are wonderful combined in this sparkling, unstoppable cocktail. When you add rosemary and tonic water, you get a grown up flavor. Just the right amount of sharp herbs and bitter tonic. The Everclear makes both of them pop here. This is definitely a grown up drink, and even without the alcohol, it’s a little too tart and herby for the littles in your crowd, so I’d skip offering it to them. My Mulled Apple Cider Punch can be served with or without alcohol, making it perfect for little guests. And, it just happens to pair wonderfully with this punch, so you can serve a pair of truly spectacular cocktails at your holiday party. And best of all, they can be made in advance, and served for a crowd. No single-serve mixing here. All you’ll need to do is simmer the ingredients together in a saucepan for about 20 minutes to get this wonderful almost-syrup. When you mix it with tonic, Everclear and ice, it becomes the perfect, sippable punch. So clink up and drink up – it’s time to celebrate! Pour cranberry juice cocktail and water into a pot set over medium heat. Add fresh cranberries, sugar, rosemary, and sliced orange to the pot and bring to a low boil. Reduce heat to low and allow mixture to simmer for about 15 minutes until reduced slightly. Strain out fruit and rosemary. Chill cranberry mixture until cold. 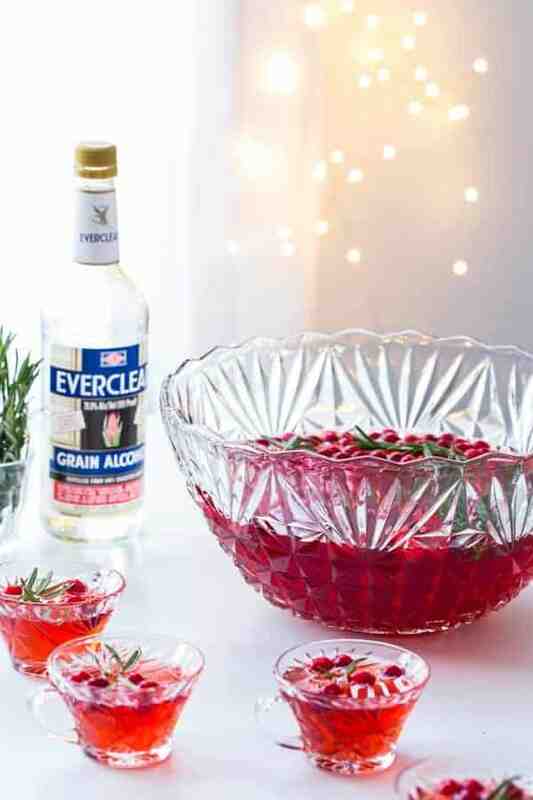 Pour cranberry mixture into a punch bowl and stir in Everclear, tonic water, and ice. 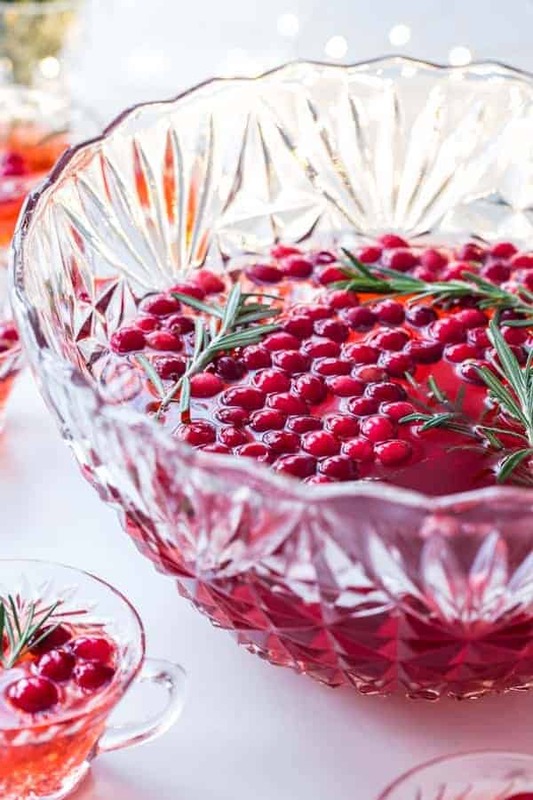 Serve in punch glasses with fresh cranberries and rosemary sprigs for garnish. I really would love to have your Prime Rib recipe! Your Red Velvet Poke Cake is fabulous! Thanks so much for all your recipes! You’re the best!!! Xoxoxo Merry Christmas!!! You’re so welcome, Nicki! Thank you for your kind words! This punch turned out so gorgeous! I need to make this for Christmas! This is so perfect and festive, Jamie! I love it! hey – i am planning on making this and was curious if their was an ingredient missing? It lists one cup above the Everclear. Is there another liquid to add? Thanks so much! Hi, Jean! Thank you for bringing that to my attention! There’s no extra ingredient, and I fixed the recipe. I hope you enjoyed it! Looks so delish & tasty!!! What a delight of mmmm!!! Wonderful! All the best to you!